Issue 8.10 is now online! This double-sized issue contains three Applications articles and two Open Access articles. These five papers are freely available to everyone, no subscription required. – Phylogenetic Trees: The fields of phylogenetic tree and network inference have advanced independently, with only a few attempts to bridge them. Schliep et al. provide a framework, implemented in R, to transfer information between trees and networks. – Emon: Studies, surveys and monitoring are often costly, so small investments in preliminary data collection and systematic planning of these activities can help to make best use of resources. To meet recognised needs for accessible tools to plan some aspects of studies, surveys and monitoring, Barry et al. developed the R package emon, which includes routines for study design through power analysis and feature detection. – Haplostrips: A tool to visualise polymorphisms of a given region of the genome in the form of independently clustered and sorted haplotypes. Haplostrips is a command-line tool written in Python and R, that uses variant call format files as input and generates a heatmap view. In this month’s first Open Access article – ‘A guide to null models for animal social network analysis‘ – Farine highlights why null models are important for robust hypothesis testing in studies of animal social networks. Using simulated data containing a known observation bias, he tests how different statistical tests and null models perform if such a bias was unknown. Schmid et al. present hybridization capture from RAD-derived probes obtained from a reduced exome template (hyRAD-X) in the second Open Access article in our October issue: ‘HyRAD-X, a versatile method combining exome capture and RAD sequencing to extract genomic information from ancient DNA‘. HyRAD-X is a technique applying RAD sequencing to messenger RNA from one or few fresh specimens to elaborate bench-top produced probes to capture homologous DNA from a samples set. Our October issue also features articles on Climate Change, Biodiversity, Monitoring, Bioinformatics, Phylogenetics, Conservation and more. 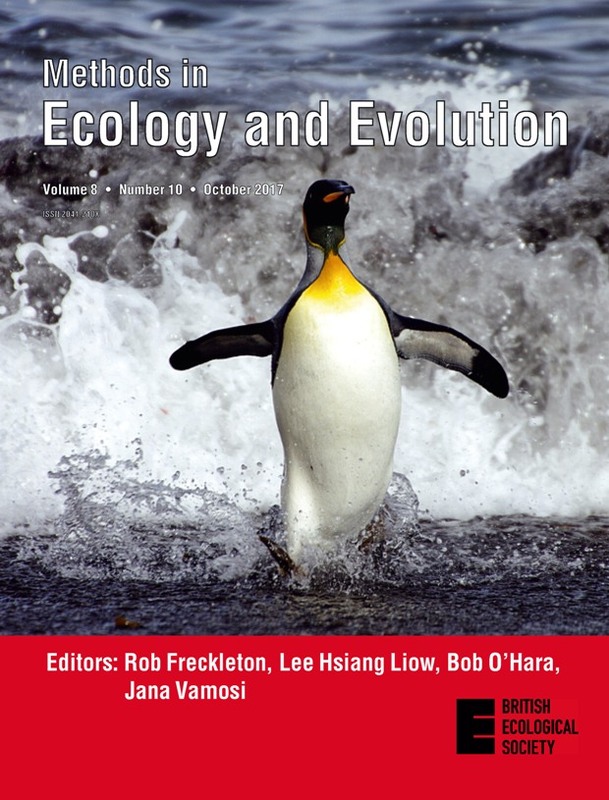 This month’s cover image shows an emblematic bird, the king penguin (Aptenodytes patagonicus), coming out of the water to reproduce on Possession island in the Crozet Archipelago. King penguins have an incredibly demanding life cycle, alternating between long-term fasting periods on land to reproduce or moult and periods of intensive foraging at sea, several hundreds of kilometres from their breeding grounds. The biology and ecology of the king penguin has been studied in Crozet by scientific programs of the French Polar Institute since the early 1960s. In ‘How to measure mitochondrial function in birds using red blood cells: a case study in the king penguin and perspectives in ecology and evolution‘, Stier et al. developed a minimally-invasive methodology to assess mitochondrial function in bird species from small blood samples using this emblematic bird — capitalising on their previous finding that avian red blood cells possess functional mitochondria. Mitochondria are the powerhouse of eukaryotic organisms, but studies of mitochondrial function in the wild have been very limited so far. This is mostly due to the invasiveness of the classical methodological approach (i.e. using muscle or liver samples). Measuring mitochondrial function in a minimally-invasive manner therefore opens a broad range of opportunities in the fields of ecology and evolution. For instance, it could help to investigate the importance of mitochondria in shaping animal life histories or to understand the functional consequences of genetic differences observed in mitochondrial genes between populations. This entry was posted in Journal updates and tagged Ancient DNA, biodiversity, Bioinformatics, climate change, conservation, ecology, evolution, Haplotypes, King Penguins, Mitochondria, monitoring, Null Models, open access, phylogenetics by Chris Grieves. Bookmark the permalink.